"We come from the land of the ice and snow, From the midnight sun where the hot springs blow. The hammer of the gods will drive our ships to new lands, To fight the horde, singing and crying: Valhalla, I am coming!" A classic, early, primitive monster show that is amazing from start to finish! Stand-outs, among this entirely excellent show, are the great riffing intro to The Train Kept A Rollin', the epic As Long As I Have You and How Many More Times medley, and an incredible, 10 minute version of For Your Love that surpasses the original version by leaps and bounds. The song was introduced by Plant as "a thing Keith Relf had something to do with. Do you remember him? Works for Hammersmith Council now!" (sic!). The group is billed with Alice Cooper as opening act, which lists them as: "Led Zeppelin featuring Jimmy Page, formerly of the Yardbirds". Upon their arrival to California, Page suffers from a fever and is forced to eliminate the 2nd set from these series of shows. We can certainly feel that the performance of the band captured by the tape is one of its earliest, since most of the tunes are played in more compact manner than they became in later stages. Here, improvisations are confined to minimum levels. However, the brutality of Bonzo's drum playing and the wide range of Robert's voice is incredible. Jimmy also seems to have been doing some experimental guitar works here. 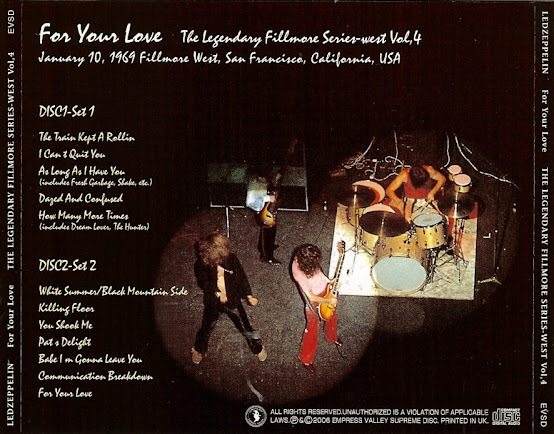 For Your Love rounds out this performance and the band play it as it should have been originally. It doesn’t get more psychedelic than this version. 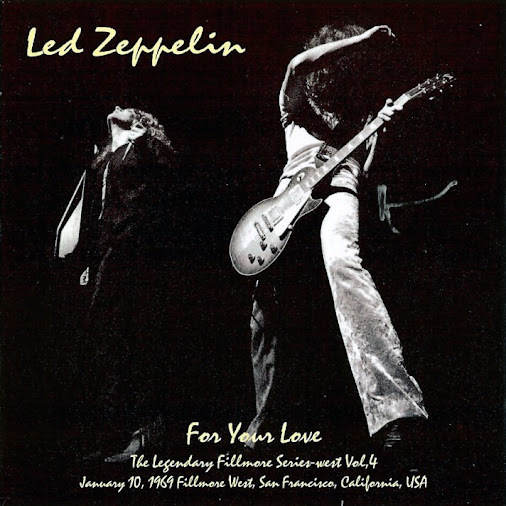 Very heavy version of As Long as I Have You, thanks mostly to Bonzo's relentless assault on the drums. The arrangement is very loose tonight with Page trying out a lot of different riffs and rhythms. Page's fingers are a little sticky, but his guitar sounds like a razor blade. The intro to Train Kept a Rollin' is a cacophony of thunderous drums and lightning guitar. Plant's harmonica collides with Page's guitar during the short solo. Plant mentions the upcoming release of the first album before the first live recording of Babe I'm Gonna Leave You, performed in a style similar to the early studio outtakes. Dazed and Confused is introduced as "a number we wrote." Jones bends the notes of the intro for a strange effect. Plant, Jones, and Bonzo improvise through the bow solo. The guitar solo is an explosion with Bonzo attacking his cymbals nonstop. The first live recording of Killing Floor is much shorter and played at a much quicker pace than the eventual version of The Lemon Song that would appear on Led Zeppelin II. Plant's mention of Keith Relf draws a lot of applause, causing him to shout "too much!" His intro of For Your Love also brings a mention of Dave Dee, Dozy, Beaky, Mick & Tich. The Yardbirds classic is mostly a venue for an extended guitar solo/jam, which is unfortunately cut in the middle. Plant's goodnight brings shouts of "more!" from the crowd and another mention of the forthcoming first album. The tape is very clear with Page and Bonzo in the front. Being an exceptional quality recording from such an early date (less than four months after their first live appearance) makes this a must hear. 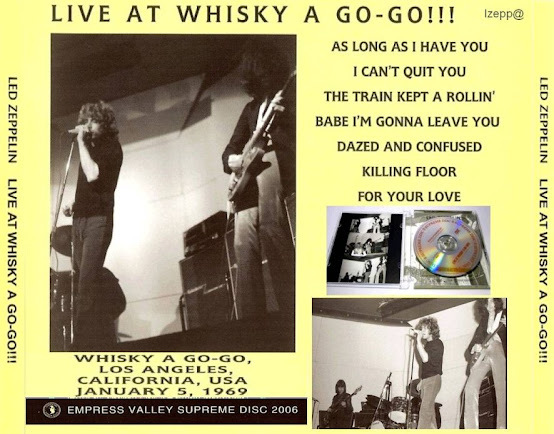 The only known recording of Led Zeppelin live available from 1968. The recording itself is quite good for the era and gives a glimpse of the raw power of the group only three days into their first ever US tour. Robert comments on how cold it is in Spokane and how the equipment had to be heated up with portable heaters and his voice is absolutely amazing ... he hits the highest notes imagined with no effort! Jonesy and Bonham are incredible and Jimmy's playing is wonderful too. The songs are played shortly and compactly, meaning more energy. 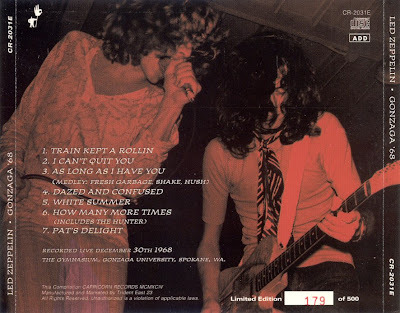 The Train Kept A Rollin' sounds like the Yardbird's version before it evolved into the blistering Zeppelin version. We can only imagine the audience seeing this then-unknown group for the first time. How obscure was the opening band for Vanilla Fudge at Gonzaga University on Dec. 30, 1968? Well, the ads in both The Spokesman-Review and Chronicle read, "The Vanilla Fudge, with Len Zefflin." The ad copywriter misheard the name and thought it was some guy named "Len Zefflin." Little did anybody know that old Len would turn out to be Led Zeppelin, one of the most popular and influential rock bands of all time, whose reunion concert this month made worldwide news. That 1968 show at Gonzaga's Kennedy Pavilion would later assume a historic status in Zeppelin lore – all because a student brought a small tape recorder. 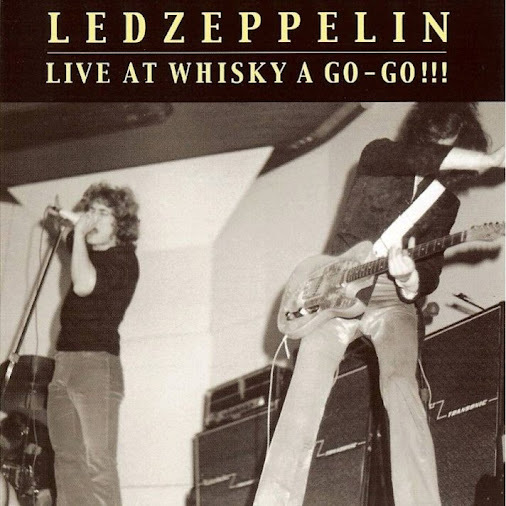 Today, this tape – bootlegged and distributed all over the world and the Web – is widely considered the first Led Zeppelin concert ever captured on tape; the earliest live recording of Led Zeppelin ever. Here's how lead singer Robert Plant introduced one of the songs: "This is off an album that comes out in about three weeks time on the Atlantic label. It's called 'Led Zeppelin.' This is a tune … called 'Dazed and Confused.' "
So their first album wasn't even out yet. The album would not make a mark on the charts until February 1969. This concert was only their fifth in the U.S. The band had done tours of the U.K. and Scandinavia a few months before, many of them as The New Yardbirds, the band's short-lived original name. Some of these dates were actually leftover bookings for the Yardbirds, guitarist Jimmy Page's earlier band. Page and his new mates Plant, John Bonham and John Paul Jones had taken over some of these concert bookings. So the band was mostly an unknown quantity. Yet at least one concertgoer, Bob Gallagher – a record store 4,000 Holes – was aware that he wasn't going to see some guy named Len Zefflin. "We knew who Jimmy Page was, from the Yardbirds, and we heard it was his band," said Gallagher, who was a teenager at the time. "I was a big Vanilla Fudge fan because psychedelia was really happening then. … But we were excited about seeing Jimmy Page." Spokane was experiencing a severe cold snap that week, with temperatures dropping to 10 below. Apparently, the Kennedy Pavilion (Gonzaga's gym) wasn't well-heated either, because many fans remember it as being icy inside, as well. But when Led Zeppelin launched into the first song, the place heated up. "Bonham came out and started drumming on 'Train Kept a-Rollin',' and everybody went, 'Holy crap,' " said Gallagher. "There's never been a drummer like him. He was awesome. Then they all started playing and they were totally amazing." Plant said, between songs, "You won't believe this, but I don't think that either ourselves or our equipment is quite used to the temperature. It's taken about three hours of gas stoves under the equipment to get everything going." A little later Plant said they were now "getting warmed up properly," and you can hear the crowd response building after each song. By the evidence of the recording, the band's sound was already fully formed, distinguished by Plant's wailing voice – at one point he sounds like a siren – and Page's virtuoso guitar. "What I mostly remember is when Jimmy Page took out a violin bow and began bowing his double-neck guitar," remembered Jeff "Tor" Nadeau. "The house was universally mind-blown. It was the most stunning and awesome sound ever." "It took about a half a song before everybody was blown away," remembered David Priano. "When Plant harmonized to Page's pipe-wrench riffs, the audience went nuts. The other thing I remember was the drum solo (during 'Pat's Delight'). As a rule I don't like them. This was the exception. When he threw away his drum sticks and finished with his bare hands – far out." "We were hoping that the first band wouldn't stay on stage too long," said Kerry Whitsitt of Spokane. "Little did I know that by the end of Led Zeppelin's set, I would be reeling in my seat, transfixed by Robert Plant's voice, body language and raw sexuality (I just knew he was looking straight through me most of the night). … It was electric in every sense of the word. We didn't want them to leave the stage – ever!" Whitsitt recalls that Vanilla Fudge "paled in comparison," even though that band was riding high at the time with a hit version of "You Keep Me Hangin' On." Mike and Dorothy McMurtery said they left the show more impressed with Led Zeppelin, "whose hard rock music was ahead of its time for Spokane." Dave Cole said he was startled, at intermission, to see who was standing in line behind him at the concession stand. "Right behind me were Jimmy Page and Robert Plant, waiting to order," said Cole. "I thought it was pretty cool at the time. Several months later, when their first album was released and they got a lot more famous, I began to think it was even cooler." Gallagher described the show as a turning point in his musical life. He said that he and his friends were simply "flabbergasted" by the time Led Zeppelin left the stage. "Then when Vanilla Fudge came on, they were so sleepy," said Gallagher. "It was like, after that, psychedelia was dead and heavy metal was born, all in a three-hour show. We didn't care about psychedelia anymore. We all just ran back to our Yardbirds records." "We felt transformed," said Whitsitt. "Those of us who experienced it together felt like we were in a special club." About 30 years later, one member of that club walked into Gallagher's store and started talking about that show.